The LM432 is a three terminal adjustable shunt Regulator with thermal stability guaranteed over temperature. 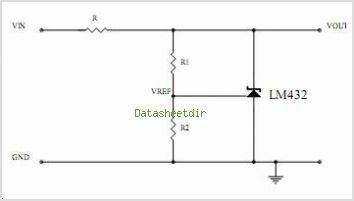 The output voltage CAN be adjusted to any value from 1.24V(VREF) to 20V with two external resistors. The LM432 has a typical dynamic output impedance of 0.05. Active output circuitry provides a very sharp turn on characteristic, making the LM432 an excellent replacement for Zener Diodes The LM432 Shunt Regulator is available with four voltage tolerances(0.25%,0.5%,1% and 2%), and two package options(TO-92 and SOT-23). This allows the designer the opportunity to select the optimum combi- nation of cost and performance for their application. By Cystech Electonics Corp. This is one package pinout of LM432,If you need more pinouts please download LM432's pdf datasheet. 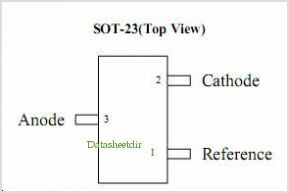 This is one application circuit of LM432,If you need more circuits,please download LM432's pdf datasheet.